Making a drop waist dress uses the same skills and techniques as making the dress with a bodice. the new skill used for both of these is gahering the skirt and attaching it to the bodice. For the drop waist dress, the bodice is longer, which can lead to some other cute designs. Like a dress with a pleated skirt. Or a dress with a Victorian bodice. Or just using the bodice pieces as a top, with no skirt. I will cover these later this week. In this tutorial, I gave the dress ruffle sleeves. It could also be sleeveles or use any of the other sleeve patterns. Start by cutting out all of the pieces (sign up for free pattern nd newsletter at the end of this post). If you already receive the newsletter, you're all set. Sew shoulder seams of bodice together. Sew shoulder seams of the bodice lining together. for this dress I used the same fabric. Match and sew lining and bodice back edges and neckline together. Clip curves and corner so it will trun nicely and has crisp corners. If you are adding the ruffle sleeves, iron them with a fold down the middle. Stitch two rows of gathering along the raw edge of each sleeve. Pull gathering for sleeve to fit in armhole. Instructions for ruffle sleeves are also here. Pull gathers to fit armhole length and stitch in place to one layer of the bodice. Follow the same stitching line to stitch other layer of the bodice to sleeve. Turn right side out. Your bodice now looks like this. 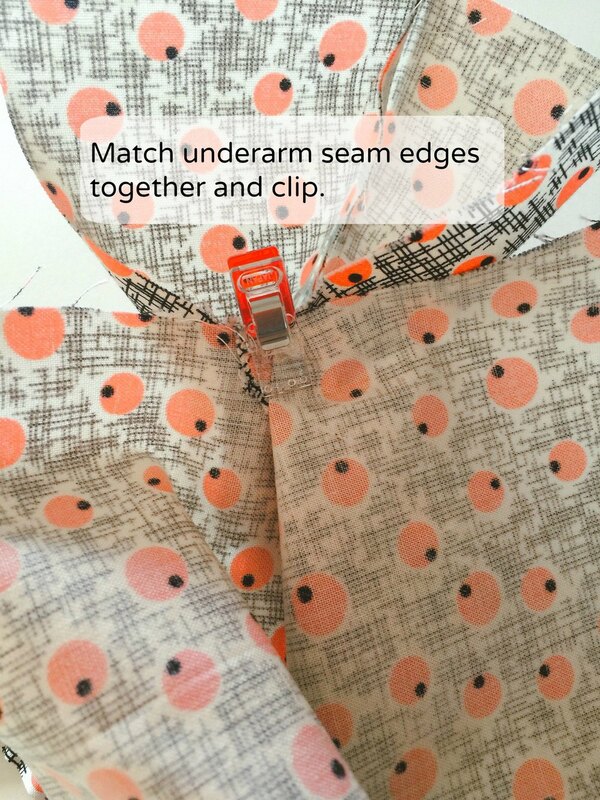 Sew side seam by matching the underarm seams between the lining and the bodice. Stitch from bottom edge of bodice to bottom edge of lining on each side. See Reversible Dress Tutorial for help on this. Your bodice should look like this. Finish the edges of your skirt. I did a narrow hem and then ironed it over about 3/8 of an inch. Stitch two rows of long stitches for gathering the skirt and pull until the skirt will fit along the bottom edge of the bodice. Tutorial on sewing skirt to a bodice here. Stitch the skirt to the bodice. I often make fabric trim for my doll clothing. It gives me the flexibility to create exactly what I need and it's not hard. You just need the right tool. The Clover bias tape maker. They come in a range of sizes. You can buy them individually or as a set. Although I have used all of my set, I use the 1/2 inch most frequently. Once you have selected your fabric, cut a one inch strip. Cut a one inch strip. Cut a long strip, then you will have extra trim for later. The trick to this gadget is getting your fabric through correctly from the start. I have found the easiest way to do this is to use a large needle with a knotted thread attached to the end of your fabric strip. Dangle the needle through the bias maker starting with the wider yellow side and when it appears out the other end, pull it and the fabric will come with it. The trick to this gadget is getting your fabric through correctly from the start. Iron your fabric as you pull it through. it works best to do a little at a time. Once you are done, there will be a right side and a side where the edges of the fabric show. Iron a few inches at a time. Bias can be used for waist band trim or trim along the bottom of a skirt. I sew the waist band trims on by hand and the skirt trims usually by machine. In another post I will show you tricks to sewing trims on by machine. I generally sew waist trims on by hand. Most of my dress bodices are lined and sewing by machine through both layers can be tricky and often does not look good. So to avoid problems, I hand sew it, which is usually quick, neater and more accurate. Start by pinning your trim in place. Fold under at least 1/4 inch at the two ends. I begin with sewing the bottom edge in place. This edge is the one that needs to match up accurately with the top of your skirt, so best to start here. Take small edge stitches. See how very little of the stitching shows inside your dress. Start on the bottom edge, since that is the edge that needs to be accurately lined up. Very little will show inside if you sew by hand. The right waist band can make a simple dress look finished. Your dress is done! And Save your leftovers. I have a little basket of all my bias trims. If I'm not sure what to add to a dress, I will look here first.